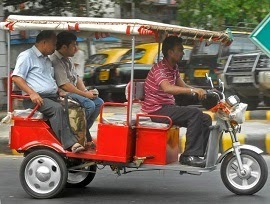 E-rickshaw runs on battery and is considered an environment-friendly vehicle, is illegal and is not insured, and hence passengers taking ride on it, will not get any claims from insurance companies if the rickshaw meet an accident, according to an official from the Delhi State Transport Ministry. Currently, more than one lac eco-friendly rickshaws run on Delhi roads are not 'vehicles' as per the provision of Central Motor Vehicle Act. iCAT, a government testing agency, had earlier asked the Delhi State Transport Ministry that it was ready to carry out test on e-rickshaws, but the government didn't show interest. The official is sure that the tests would substantiate that these are motor vehicles and hence these have to be registered as per rules. “Once this is established, the manufacturers will have to take type approval from the government approved testing agencies after the prototype meets all the required standards. While giving type approval, the agencies will have to ensure that the vehicle is safe for passengers,“ the official said. Even in case the tests prove that these are not motor vehicles, the municipal bodies must regulate them as it is done even in the case of cycle rickshaws, he added.